Adenimun belongs to the genera Apocynaceae, Which it native to Africa, the middle east and Madagascar. The Desert rose is the only Adenium found in wide cultivation, although it has been hybridized extensively to obtain different flower colors, ingcluding orange, white, sriped and the tradisional red. Desert rose or Adenium obesum is a beautiful plant. These plant is a striking with swollen succulent stems and deep red flowers. Desert rose is deciduous in cooler winters, but it can be kept in leaf provided there is sufficient warmth and light water. All of these plants command interes, from the dramatically swollen stems on oleder plants to the brignt flowers to the tight clusters of narow, green leaves. Desert rose can beautiful gworing with conditions on full sun, perfect for a sunny window. And water in the winter but keep hydrated enough to retain its leaves. Don't forget to keep at least 50 degres at all the times. Because if you keep temperatures of 60 degres or higer during the winter, the plant may retain its leaves. Repot as needed for desert rose bonsai, preferably during the warm season. To repot a succulent, make sure the soil is dry before repotting, then gently remove the palnt from the pot. Knock away the old soil from the roots, making sure ro remove any rotted or dead rooths in the prosess. 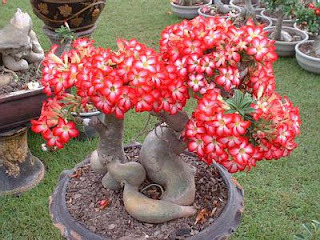 Adenium Desert rose Bonsai are not difficult plants to grow well, provided the get enough sunlight and warmth. Like all succulents, the can't tolerante sitting in woter, and if you err, do it on the side of too little water. Use a specialized soil mix desigded for succulents and cacti.